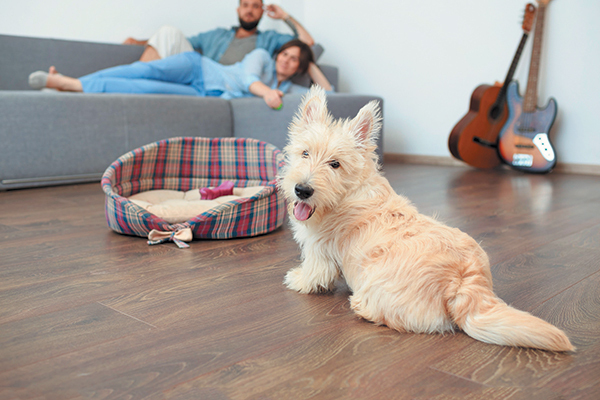 Many dog owners keep cleaners in their homes that are not exactly pet safe out of habit or ignorance of the bad effects they have on the household. Cleaning products with ingredients such as bleach, ammonia, chlorine, gycol ethers or formaldehyde can cause many problems in adults and children, but young children and pets are particularly at risk for things such as cancer, anemia, liver and kidney damage. Many toxic cleaners are also carcinogenic. So, what are some household cleaning products that are not safe for dogs? Is Pine Sol safe for dogs? Is Lysol safe for pets? Are Mr. Clean, Clorox Bathroom Cleaner and Scrubbing Bubbles safe for dogs? What about detergents like Tide and Cheer? 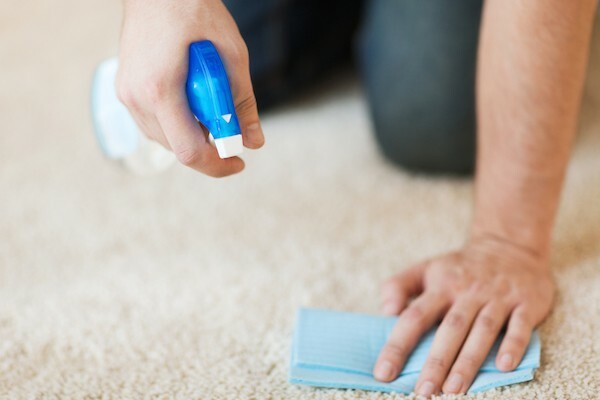 Several studies have been done on the dangerous effects of some common cleaning products. Many of these included data on pets which showed that Fido and Fluffy are not immune to chemicals and that many cleaning products are not pet safe. One study concentrated on measuring volatile organic compounds (VOCs) in cleaning products. In it, the vapor pressure of various chemical compounds in cleaners was measured. Three cleaners, Pledge, Clorox Wipes and Lysol Disinfecting Spray, registered close to a thousand times more vapor pressure than a natural cleaner. This means that even when the toxic cleaners are put away and closed, the vapors left behind can continue to harm both us and our pets. Man cleaning carpet. Photography by Syda Productions / Shutterstock. Ammonia – Used in many de-greasers for ovens, glass and stainless steel, ammonia has a very high VOC, burns mucous membranes and contributes to asthma. If it is mixed with bleach, it creates a poisonous gas which can be deadly to small pets. Chlorine – Used in disinfectants, toilet bowl cleaners and automatic dish detergent to name a few, chlorine is also used to bleach coffee filters. It can cause everything from dizziness to vomiting to laryngeal edema. Avoid this ingredient and be careful about letting your pet swim in the pool. Glycol Ethers – Glycol ethers are found in many cleaning products that are not pet safe including glass cleaners, carpet cleaners and spot removers. It has been linked to anemia, lung damage and kidney damage in people and pets. Formaldehyde – The thought of a funeral home comes to mind when formaldehyde is mentioned and everyone can recognize the strong, nauseating smell. But it’s also used in products such as soaps and even some pet shampoos. It can contribute to asthma and is carcinogenic. Floor Cleaners – These include Pine Sol and Mr. Clean. 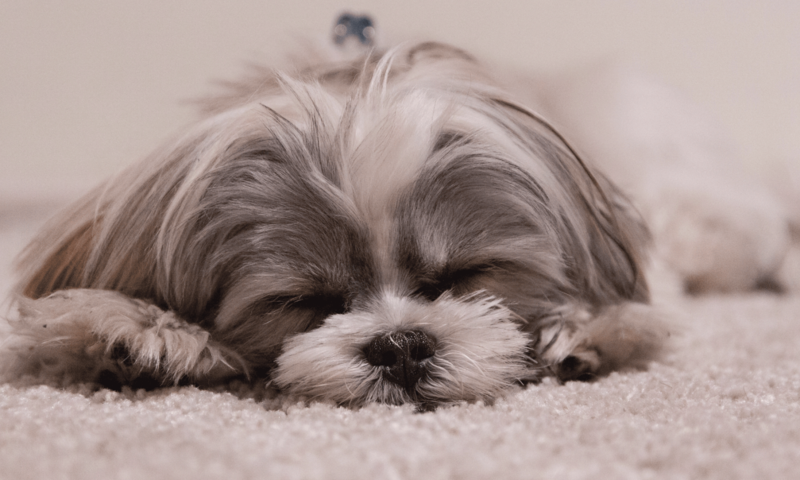 Even if you manage to get all of the residue off the floor, the vapors linger and are dangerous to your pet. Try a non-toxic, pet safe cleaner instead. Bathroom Cleaners – These include Clorox Bathroom Cleaner and Scrubbing Bubbles. Try a product such as Ecover Bathroom Cleaner instead. Never use a continuous toilet bowl cleaner such as Clorox Automatic Toilet Bowl Cleaner. It is very dangerous and the temptation to drink out of the toilet is a quirk in many of our pups. All Purpose Cleaners – For use in the kitchen and around the house, the most common toxic all-purpose cleaners that scream “Danger!” are Mr. Clean Multi-Purpose Spray and Formula 409. Drain Openers – You may think that since this product is poured down the drain, it can’t be harmful to your pet. But the toxic drain openers give off dangerous fumes long after you’ve emptied them. For a non-toxic, pet safe option, try a product such as Earth Friendly Enzymes Drain Opener. Glass Cleaner – It may seem that toxic glass cleaners are simpler products and are, therefore, safe but they are not. Instead of something like Windex, try a product such as Nature Clean Window and Glass Cleaner. Laundry Detergent – It’s easy to assume that choosing a laundry detergent isn’t that important because the rinse cycle rinses it away. But there is residue left behind on clothes and pet blankets that can be harmful to your pet, especially those that chew on their bedding. Avoid detergents with toxic ingredients such as Tide and Cheer and try something like Down East’s Liquid Laundry Detergent. Instead of using toxic cleaning products around the house, try one of the non-toxic and pet safe lines of cleaners. If you do decide to keep toxic cleaners, make absolutely sure they are put away. Put child safety locks on cabinet doors and put cleaners up as high as possible. Never use them when your pet is in the same room and air out the house after cleaning with them. Never leave any residue behind. But the warning signs are clear and you and your dog will be healthier and safer if you use cleaning products that are pet safe. Tell us: What nontoxic cleaning products to you use instead of cleaning products that are not safe for dogs? April is Spring Cleaning month here at Dogster! Stay tuned for a few articles every week on all things spring cleaning and dog — whether that’s dog-safe ways to clean your home, spring-cleaning your dog’s grooming routine with advice on brushing and bathing — and much more. The post 6 Household Cleaning Products That Are Not Safe for Dogs appeared first on Dogster. How Safe is Pepto-Bismol For Dogs? South Delhiites Will Soon be Paying Fine For Not Cleaning After Their Dogs. Police Dogs For Adoption: What do You Need to Get It?